I only just noticed this today - Calculator is gone. Is this an "improvement" with 10.13.5 which I installed just the other day, or did I break something? 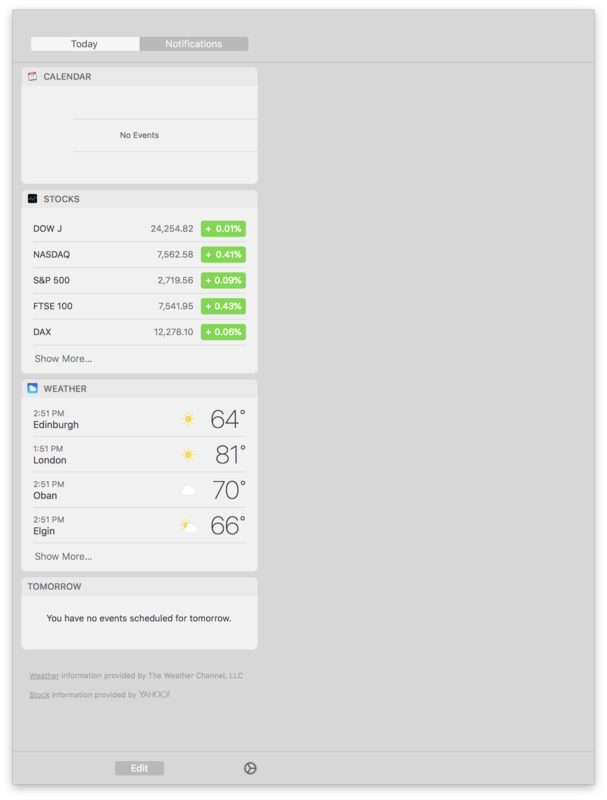 I did notice Stocks appear in there as if by magic the other day - something I'm never ever going to need, but I hadn't spotted Calculator's disappearance until now. 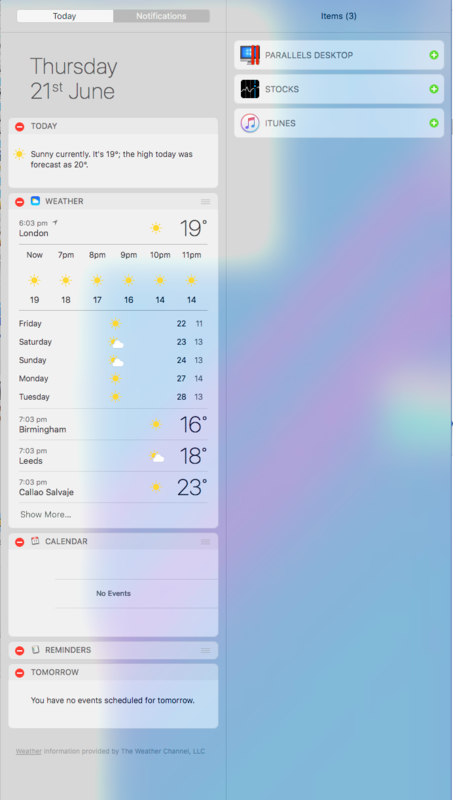 so now I need to figure out a way to get the Notification Centre to recognise it again. so they're missing there. Does that mean there's a defaults write to put them back? 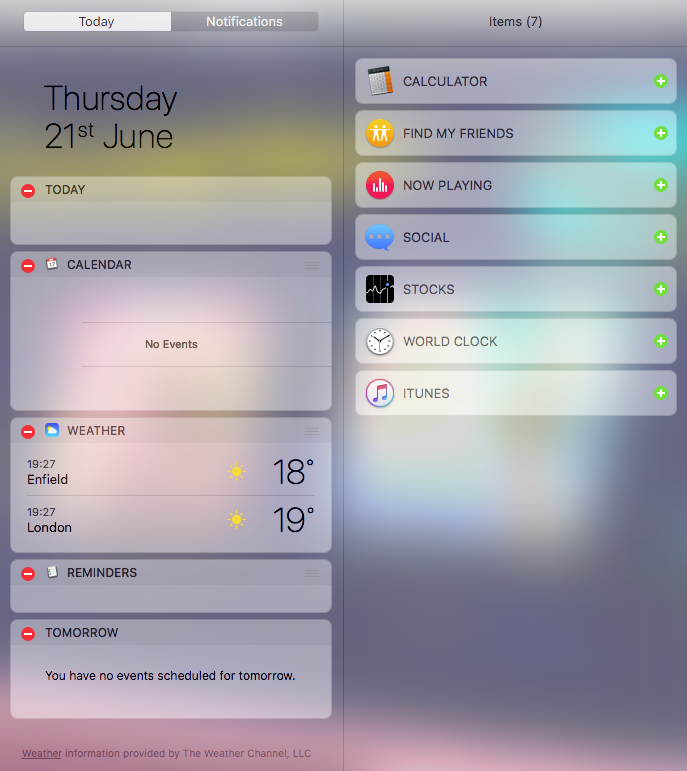 When it comes to troubleshooting Notification Centre widgets, there are a number of options you can try. This is really the first thing to try. Refer to Seamus' answer for the steps involved. If the Notification Centre / Widgets do not work fine in the other Account, then use macOS Recovery to Reinstall macOS (NOTE: Ensure you have a full backup prior to doing this). Likewise, you can use macOS Recovery to restore from a Time Machine backup that was made prior to problems with Notification Centre (NOTE: Ensure you have a full current backup prior to doing this, so that you don't lose any recent documents, emails, photos, etc). NOTE: If you've tested another User Account and the Notification Centre / Widget is not working fine in that account, then do not proceed with this option. If you see a .plist file for the specific widget (e.g. 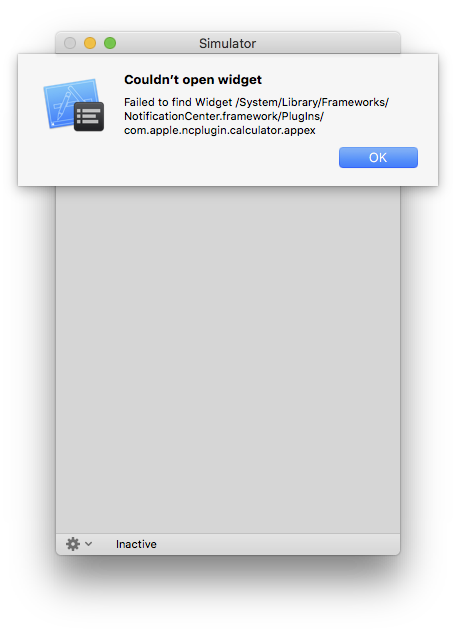 com.apple.ncplugin.calculator.plist and/or com.apple.calculator.plist), then delete it and restart your Mac. 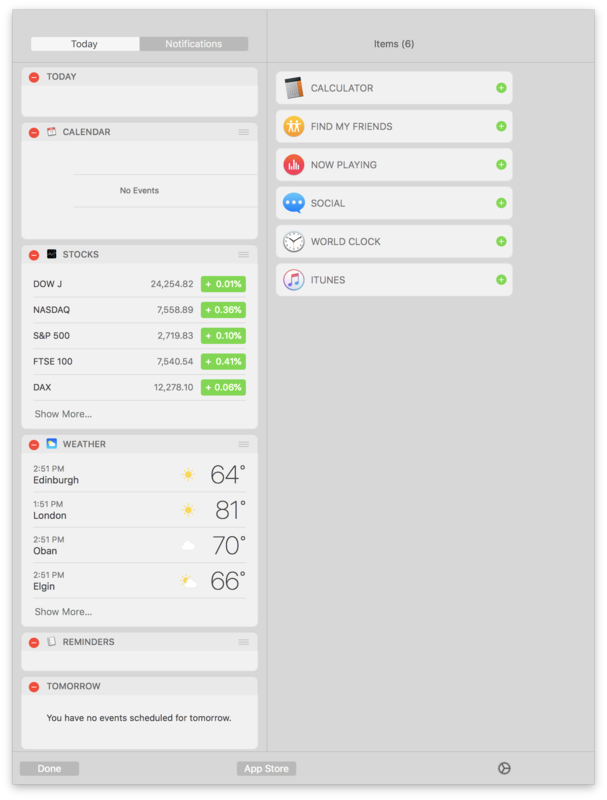 Grab a known good copy of your widget from a Time Machine backup or another computer. In this case (i.e. 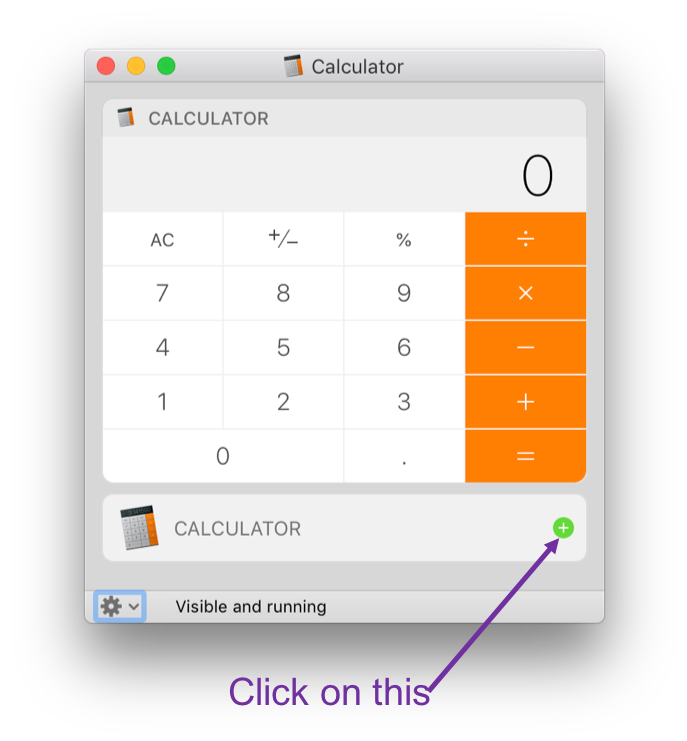 a macOS High Sierra installation), the Calculator widget can even be replaced with one from macOS Sierra. NOTE: To do this you will need to temporarily disable System Integrity Protection (SIP) on the Mac you're having problems with. I guess the heading says it all. Go to Apple > System Preferences... > iCloud and sign out. Once you're signed out, then sign back in again. NOTE: Reindexing your boot volume can take a long time. How long depends on the size of your drive and how much data is stored on it. Follow the steps here to reset your password first and then to create a new Keychain. Obviously this will take a few hours, but this will definitely solve the problem (assuming that when you tested another user account at 3 above it worked fine). Essentially you're creating a new account and migrating all your data to that one instead. Click on the EDIT button at the bottom of the panel. Several "Items" will appear to the right of the panel, including the "Calculator" item. Click the + icon the the right of the Calculator. 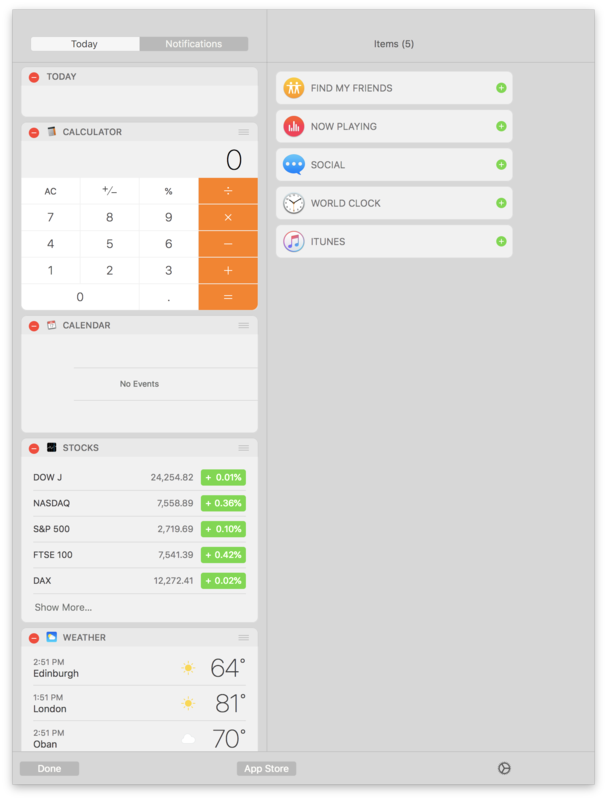 The Calculator is moved into the main panel of the Notification Center. Click the Done button at the bottom of the panel. 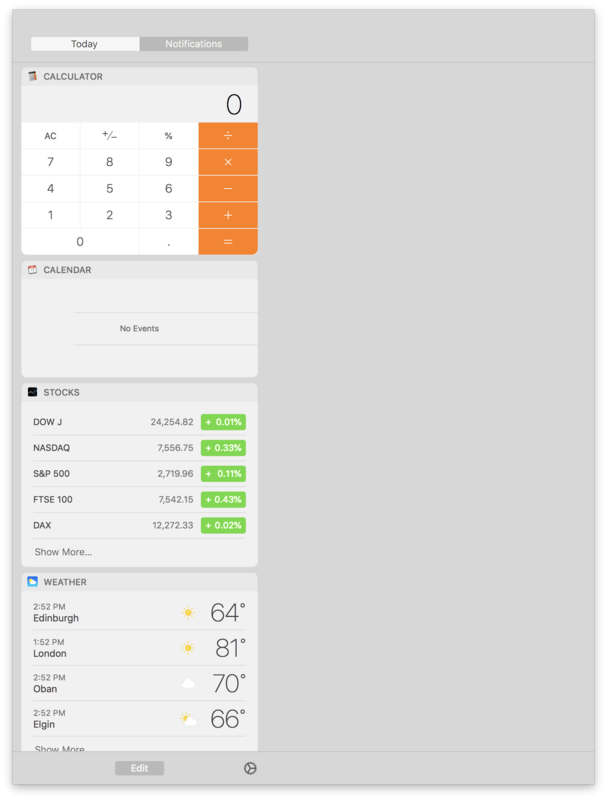 The options disappear from the panel, and the Calculator remains in the Notification Center panel. Not much of an answer, but I eventually solved both this issue & also Recurring Volume damage + Time Machine issues by cloning the drive, reformatting to HFS+ & cloning back again. No amount of messing with APFS would fix it. But see Monomeeth's answer here for a great troubleshooting guide. Not the answer you're looking for? Browse other questions tagged macos high-sierra notification-center .